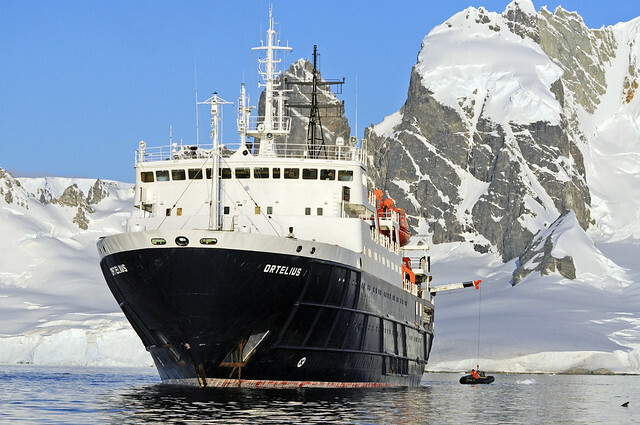 Oceanwide Expeditions vessels m/v Ortelius, m/v Plancius, and s/v Rembrandt van Rijn are known as comfortable floating basecamps operating in the remote polar regions of Spitsbergen, Greenland and Antarctica. The ice strengthened and to highest safety standards built expedition vessels function as hubs for multi activity programs like kayaking, diving, camping, mountaineering, photo workshops, hiking and snowshoeing, and ski crossings. At the end of the Antarctic summer the glaciers are still covered with snow and conditions are perfect for active people to go out and explore. Untouched mountain tops invite experienced ski mountaineers to indulge in this technical and strenuous activity. Ski mountaineers climb high snow-covered and glaciated peaks and viewpoints, mostly roped up in small groups. It’s a thrilling experienced for those skiers experienced enough to ski downhill individually and master sometimes steep, and potentially dangerous alpine environment. Certified mountain guides are responsible for the safety of the group, they supervise the activity from beginning to end. Ski Mountaineering experience, good physical condition and health is essential and must be backed up by a health statement. Participants must be able to master techniques of alpine skiing in off piste terrain (ascent and descent). Each participant is asked to submit a personal questionnaire which should highlight the ski mountaineering experience. The maximum ratio of participants per mountain guide is 8:1. Participants will bring their personal protective outdoor clothes, ski mountaineering equipment. For individuals who wish to participate in this activity please enquire for a personal registration form with Oceanwide Expeditions reservation departments in Europe or USA.